Soaring airfare prices, depressing exchange rates, and recession fears may seem like they’re conspiring to keep you at home this summer. But summer bargains are out there. In fact, as long as you play it smart and avoid long, expensive flights and countries whose currency is walloping the dollar, you should be able to do a lot on a budget this season. I’ve monitored trends, industry news, and sale patterns to point you in the direction of places that offer the best bargains for the coming season. Below you’ll find examples of deals presently available for summer trips. Like all offers, these are sure to expire; however, a little research on your part can yield similar results when you’re ready to book. Sticking to a budget once you’re in Vegas is up to you, but at least the deals for getting to and staying in Sin City are plentiful right now. Unseasonably cheap rates this spring have set the stage for an even more affordable summer season. 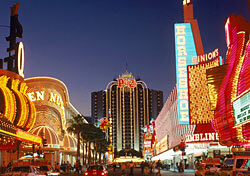 Expedia and Orbitz are both running summer sales to Las Vegas. Expedia’s sale features rates such as four nights’ accommodations and airfare from Los Angeles for $244. Orbitz is offering $50 off Vegas vacation packages booked by May 18, plus extras such as resort and dining credits and two-for-one offers on activities and spa treatments.